One of the hallmarks of human solid tumors is chromosomal instability (CIN). 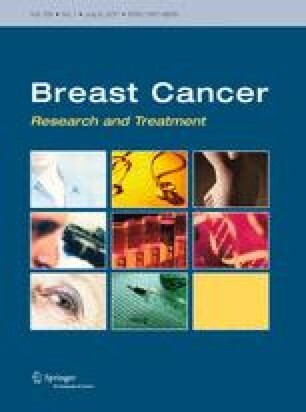 We studied global patterns as well as individual levels of CIN and determined the prognostic relevance among breast cancer subtypes. For this, we used single nucleotide polymorphism copy number data of 313 primary lymph-node negative breast cancers. The level of CIN for individual samples was determined by counting the total number of chromosomal segments showing a gain or loss per specimen. Hierarchical clustering resulted in four groups showing distinct patterns of abnormalities, predominantly characterized by 1q gain, 8q gain, 1q&8q gain, or no gain of these loci. Estrogen receptor (ER)-positive and ER-negative samples showed an uneven distribution (statistically significant) across the cluster-groups, as did the molecular subtypes and triple-negative tumors (negative for estrogen-, progesterone-, and her2/neu-receptor). The CIN-score was significantly higher in ER-negative and triple-negative samples. Among luminal cancers, luminal B had a higher CIN-score than luminal A. The CIN-score was significantly associated with prognosis, measured by the time to distant metastasis, in ER-positive, luminal B, and her2/neu subtypes, but not in ER-negative patients. Our study points to a multifaceted role for CIN in breast cancer. Within ER-negative samples, CIN is likely related to the onset but other factors govern the progression of the disease. In contrast, CIN is clearly associated with progression in ER-positive, luminal B, and her2/neu subtypes; thus, assessing CIN in these subtypes may contribute to personalized patient management. The online version of this article (doi: 10.1007/s10549-010-1026-5) contains supplementary material, which is available to authorized users. The study was supported by Veridex LLC for tissue processing and isolating RNA and DNA for microarray analysis as well as by a research grant from the Netherlands Genomics Initiative (NGI)/Netherlands Organization for Scientific Research (NWO). This organization had no role in study design, analysis of data or preparation of the manuscript. Y. Zhang and Y. Wang are employees of, and hold stock in Veridex LLC, which financially supported this study for tissue processing and microarray analysis. The other authors declare no conflict of interest.